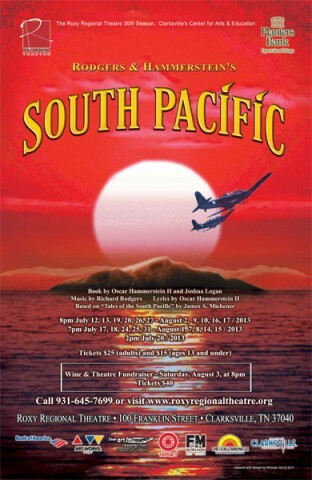 Clarksville, TN – The Roxy Regional Theatre does it again with their exquisite production of Rodgers and Hammerstein’s musical “South Pacific”. Stars John Boehr and Alicia Kelly give soulful vocal performances that brings to life the emotions and anguish of their characters on the Roxy Stage. Backed by Michael Spaziani, Elena Pascullo and the rest of this powerhouse cast, “South Pacific” creates a chemistry with the audience that takes you back to a time of men and women torn by war, romance, and prejudice. “South Pacific” is set on an island paradise during World War II and centers on an American nurse Nellie Forbush (Alicia Kelly) stationed on the island who falls in love with a middle-aged French plantation owner Emile de Becque (John Boehr) but struggles to accept his mixed-race children. A secondary romance, between a U.S. lieutenant Joseph Cable (Michael Spaziani) and a young Tonkinese woman Liat (Elena Pascullo), explores his fears of the social consequences should he marry his Asian sweetheart. Directed by Tom Thayer, “South Pacific” also features Jama Bowen as Bloody Mary, Ryan Bowie as the Professor, Ian Erbe as Abner and Bob McCaffrey, Humberto Figueroa as Henry, Greg Frey as Luther Billis, Taylor Galvin as Ensign Janet McGregor, Ashley Harris as Ensign Dinah Murphy, Jim Knoll as Morton Wise, Adriana Light as Ngana, J. Robert Lindsey as Tom O’Brien, Bobby Morales as Jerome, Mickey Rafalski as Lt. Buzz Adams, Patrick Roberts as Captain George Brackett, Emily Rourke as a Nurse, Richie Sklar as Stewpot, and Mary Nell Wooten as Lt. Genevieve Marshall. 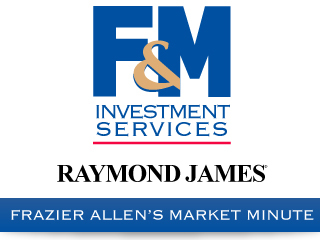 This production is made possible in part through the generous support of Planters Bank. “South Pacific” runs through August 17th, playing Wednesdays and Thursdays at 7:00pm and Fridays and Saturdays at 8:00pm.